Even as a teenager, Kathrin “Katina” Nicolacakis, MD, was hungry for a challenge. As a summer volunteer at the Akron Children’s Hospital in her hometown of Akron, Ohio, she was briefed on her responsibilities, which were primarily to deliver flowers and toys as well as direct visitors to patient rooms. But these tasks didn’t sit well with her. 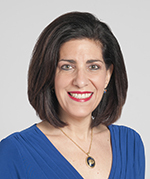 Today, Dr. Nicolacakis has focused her efforts on training her colleagues and fellows in proper medical coding and billing procedures, and she advocates for fair reimbursement—a challenge that is felt by physicians across the U.S.
As chair of the ATS Clinical Practice Committee, she helps the Society monitor payment, billing, and regulatory matters that affect the clinical practice of pulmonary, sleep and critical care medicine in the U.S. She also serves as the alternate ATS advisor to the American Medical Association/Specialty Society Relative Value Scale Update Committee (RUC), an expert panel that develops recommendations for the Centers for Medicare and Medicaid Services. In addition to teaching medicine’s business side, Dr. Nicolacakis prepares students, residents, and pulmonary fellows for clinical practice, and her clinical responsibilities are primarily in outpatient pulmonary medicine. She spends two months a year on hospital service, seeing about 20 patients a day, and otherwise, three to four days a week in the office. In addition, she is very involved in the department’s efforts in improving COPD care both in and out of the hospital. Dr. Nicolacakis earned her medical degree at Ohio State University, College of Medicine, in Columbus, and completed her internship and residencies there at the University Hospital. She then completed her fellowship in pulmonary and critical care at Case Western University School of Medicine, University Hospitals of Cleveland. She subsequently spent 15 years practicing pulmonary and critical care, first in private practice, and then at MetroHealth Medical Center. Since then, she has been at Cleveland Clinic. She also is committed to raising her two children—now 14 and 17—spending time with her husband, and cooking traditional Greek dishes from the isle of Crete where she still has family. “My goal is to eat like my great-grandmothers did,” she says. And keeping in family tradition, her teenage daughter spent time volunteering at a hospital over the summer. “She may be interested in medicine but I’m trying to keep a low profile and not be pushy,” Dr. Nicolacakis says with a laugh. For the clinician’s clinician, this may be another challenge altogether.